So, last week, I wrote about why we might consider celebrating a Passover meal with our children and the extra depth of meaning it can add to Easter. Let’s talk a bit more about practicalities and some useful terminology as you prepare your Passover meal. Firstly, the festival is called Passover but the meal is called a Seder, which means “telling” because the liturgy tells the story of he Exodus. The food is traditionally put on a Seder plate which has either little indentations or decorated and labelled areas for each of the symbolic foods. The liturgy itself is called the Haggadah. Unlike in Anglicanism or Catholicism, there is no prescribed liturgy or wording for the Haggadah, although different Haggadahs (Haggadaim? I need to ask someone what the plural is in Hebrew) will have different theological biases making them more or less acceptable to different groups of people. Any guide to Passover you download should include all the directions for the food and bits and bobs you need. We like and have used this one from Domestic Church.com or the lovely Ann Voskamp has devised one over at A Holy Experience. In terms of ages, the whole double symbolism thing isn’t really going to sink in for tiny children, even if they enjoy joining in with the overall experience and a full Seder, or even a relatively short one is a lot longer than my kids can stay at the table, which is usually about half an hour tops. I also wanted to mention that, relevant as the film is to Passover, there are some really scary bits in the film Prince of Egypt and I really regretted showing it to my almost 4 year old last year. Watch it yourself before risking it with younger children! For the 6+ crew, it’s probably fine. With the 7-11 crowd, you can probably start to show how the two stories combine but maybe just read the two narratives and do a structured show and tell type thing over the meal rather than go for a full Seder. I did find one brilliant Haggadah which was appropriate for this age group years ago but I’m darned if I can find it! With 10s and 11s and up, you can go the whole hog, and we’ve held a Seder with children that age present. We adapted the order of service to make sure the food came earlier in the evening than it would have done with the traditional order of events to be fair on boys fresh from football practice but it was a lot of fun. Passover is supposed to be an all age event with the children participating fully and drawing the narrative along with their questions so go for it! They brought a joy and curiosity to the evening which added so much to the occasion. You might shorten or simplify your Haggadah but this is precisely the age when kids start to build their own ideas about what an adult faith will look like so get them involved! Finally, there are two matters which are worth bearing mind, especially if you are inviting guests to your Seder. One is that, depending on your own church tradition, you may consider holding a Passover meal to be akin to holding communion/Mass in your own home. Some Christian Passover services/meals do include a lot of the same wording we would use in a communion liturgy so you may feel you need to either veer enough away from that to make it clear that you are not holding Communion or that you need to have someone present who is ordained. If you’re from the Baptist tradition or free church, you may think this is a really strange thought but I know for some, this is an important consideration. Personally, having read a lot of material by Michelle Guiness (see my previous post), I think that celebrating Passover is acceptable since it was Jesus, himself a Jew, who added the new layer of meaning to the celebration, rather than Christians appropriating a Jewish festival and later twisting its meaning to their own agenda. 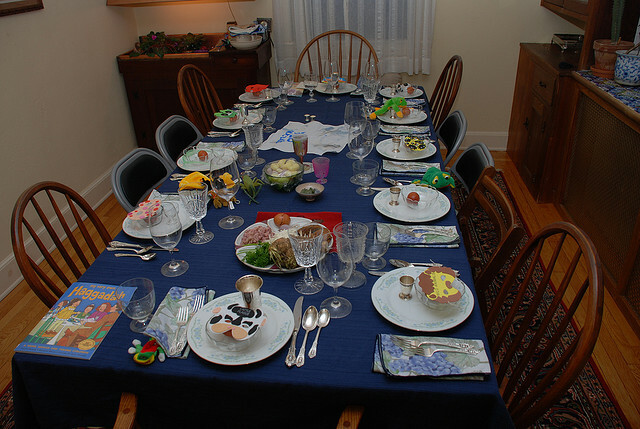 That is a personal point of view and I would be sensitive in any discussion with Jewish friends and would refrain from calling the meal we hold a “real” Seder rather than a re-enactment or exploration of the festival. I think some of the confusion for Christians, surprised at Jewish sensibilities comes from our own association with anything holy or sacred as always taking place in a church, especially if it is a corporate act of worship and anything at home being somehow less holy. This is something I have always been keen to reverse in our own home and I think the home-based approach is something we can really learn from. So, have you experienced Passover either in a Christian or a Jewish context? And how would you approach it with your own children? I’d love to know.